← Fluff, what’s not to love? Oh joy, these are appearing in the stores as I type. 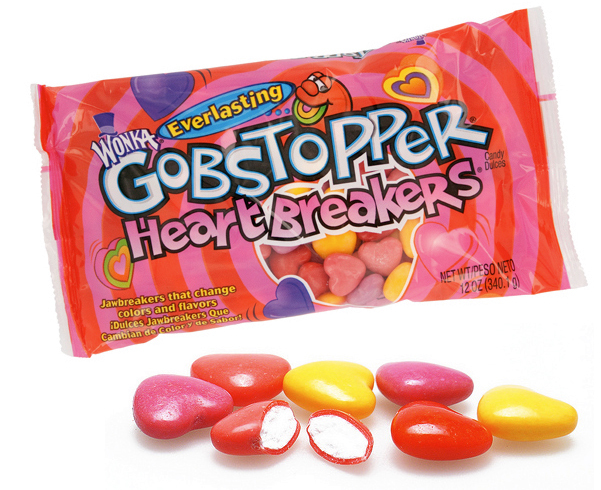 Billed as Gobstopppers, but they are much better. They are hard candy with a sweet/sour taste, and just plain yummy. An added feature is that they are really pretty on a candy dish. I will be buying several bags, since these are a limited candy, and they don’t really have an expiration date. In fact, they could just sell last years left overs this year, and we’d never know. They’ll always be good. Last year I actually ordered these on line because I only bought one bag, then went back to the store, and stood in shame as I looked at the empty shelf. (It just broke my heart….) So, I bought them at candywarehouse.com, which is where I found the above image. this site also has reviews, and like me, everyone loves these. You will, too! Posted in Hard Candy, Valentines Day. Bookmark the permalink.